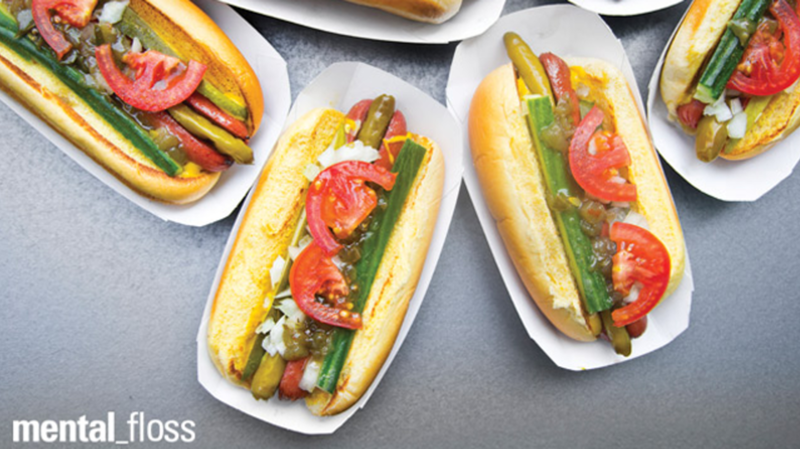 If you know only one thing about eating a hot dog in Chicago, know this: no ketchup. It’s natural to think of a Chicago dog—traditionally served with a heaping combination of toppings as improbably delicious as it is bizarre—as defined by its accoutrements, but its essence is articulated not by what’s on it, but rather what isn’t. Most Chicagoans will tell you, exasperated, that there’s no ketchup on Chicago dogs because there just isn’t. Bill Murphy, who’s served them at Murphy’s Red Hots in Chicago’s Lakeview neighborhood for 28 years, has a better explanation: “Ketchup is very powerful; it throws the whole flavor profile off.” And if you want to go off the rails, unless you’re a child or a pregnant woman, you’re on your own: Murphy’s cooks will refuse to dish out the verboten condiment. The most accepted version of the Chicago dog’s origin myth dates back to the Depression, when vendors would load up their hot dogs with common vegetables and sell them to broke customers as a cheap full meal. For a food that’s never gone out of style, the Chicago dog exists in a throwback universe: The most popular vendors are big-mouthed and talk fast, serving from antiquated stands with menus that haven’t changed in decades. In other words: Save the ketchup, and savor a classic. The Chicago dog you see here was photographed (and eaten), rather sacrilegiously, in New York City, at the Shake Shack in Battery Park. At locations globally (including Chicago), Shack makes what many Chicagoans regard as a passable, tasty “Shack-Cago” dog—though it’s missing poppy seeds. If you’re in Chicago, however, we suggest visits to Murphy’s Red Hots, Gene & Jude’s, Jimmy’s Red Hots, The Weiner’s Circle, or Wolfy’s. Or all of ’em. Photo by Liz Barclay. Purists accept only Rosen’s—their buns best withstand a dog’s heat. The simple part of this. Usually sweet, and alien-green colored. Something cold and crisp—crunch is key. A distinct seasoning improbably tying the mess together into a thing of culinary beauty. of an original. Diehard Chicagoans argue that theirs is the original. [a.k.a. the Minimalist] Some claim this is the original Chicago dog: a regular bun, mustard, onions, peppers, sometimes with relish, sometimes topped with a pile of skin-on French fries. Synonym for “hot dogs”; refers to the temperature of the dogs and the red dye the Vienna brand added for aesthetics. Trust vendors that use this terminology.